The Cure Bowl is fueling groundbreaking cancer research at UCF. Annette Khaled, head of UCF’s College of Medicine Cancer Research Division, is a member of one of four teams whose research is funded from proceeds of the AutoNation Cure Bowl. 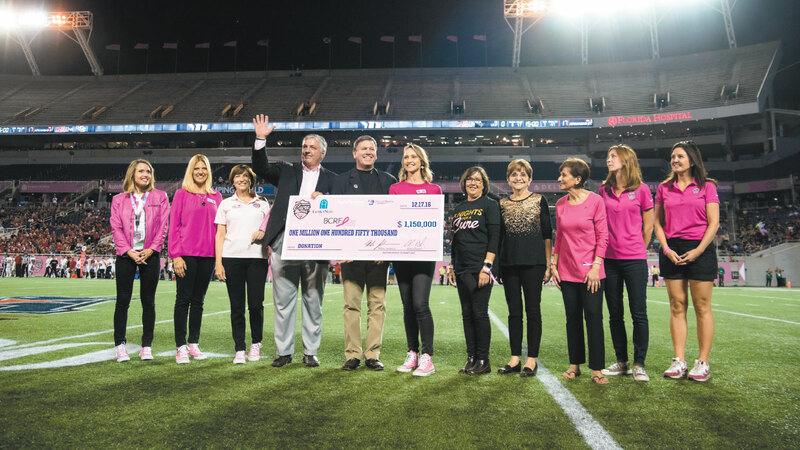 Thanks to the Breast Cancer Research Foundation and AutoNation, they will continue to receive funding every year as long as they continue to produce results. This December, the Knights may have fallen to the Arkansas State Red Wolves at the Cure Bowl, but it was still a win for UCF. Khaled’s team received $250,000, for a total of approximately $645,000 since 2015, toward their breast cancer research, allowing them to advance to the next stage of development. Their first generation of treatment relies on a small peptide encapsulated in a nanoparticle. This particle is capable of going after the primary tumor, but is helpless to deal with any cancer that’s spread elsewhere. A key component in their new plan is the research being conducted by scientist Alicja Copik. Copik’s work focuses on white blood cells called natural killer cells. She likens them to the body’s front-line defense. These warriors stop cancers and other viruses before they make us sick, unlike T-cells, which attack a specific target. Since the discovery of NK cells, they’ve been difficult to cultivate in a lab. However, research over the past decade has made NK cells easier to work with, providing a better understanding of their role. NK cells “orchestrate the [other cells], meaning they kind of give the directions to other, more specialized troops to tell them, ‘I think something bad is happening here, we need a more direct immune system response,’ ” Copik says. Using nanoparticles to signal reproduction, Copik’s research has been able to increase the number of NK cells in a person’s body ten-thousandfold, significantly boosting the body’s natural defense system response from a few soldiers to a battalion. Though barriers still exist, there’s a chance for this cancer treatment to one day replace current methods. The combined treatments could be the key one-two punch to attack the initial tumor and any cancer that’s spread to other parts of the body. Copik’s work on NK cells is currently planned for clinical trials by the end of 2017 for patients with leukemia. Other research on NK cells has shown them to be a key part in the body’s fight against HIV, Ebola and influenza. This could suggest other applications for the treatment as an injection.